Out October 2017, Trap Doors: Trans Cultural Production and the Politics of Visibility (MIT Press), edited by Reina Gossett, Eric A. Stanley and Johanna Burton. With writing/ thinking/ art by Lexi Adsit, Sara Ahmed, Nicole Archer, Kai Lumumba Barrow, Johanna Burton, micha cárdenas, Mel Y. Chen, Grace Dunham, Treva Ellison, Sydney Freeland, Che Gossett, Reina Gossett, Stamatina Gregory, Miss Major Griffin-Gracy, Robert Hamblin, Eva Hayward, Juliana Huxtable, Yve Laris Cohen, Abram J. Lewis, Heather Love, Park McArthur, CeCe McDonald, Toshio Meronek, Fred Moten, Tavia Nyong’o, Morgan M. Page, Roy Pérez, Dean Spade, Eric A. Stanley, Jeannine Tang, Wu Tsang, Jeanne Vaccaro, Chris E. Vargas, Geo Wyeth, Kalaniopua Young, Constantina Zavitsanos. 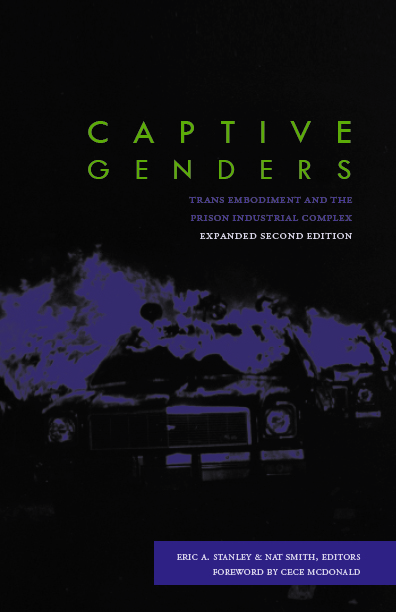 Check out two new reviews of the second edition of Captive Genders. The first is O’Brien on Stanley and Smith, ‘Captive Genders: Trans Embodiment and the Prison Industrial Complex’ by Michelle E. O’Brien and the second is The Forgotten Ones: Queer and Trans Lives in the Prison System by Grace Dunham which appears in The New Yorker. 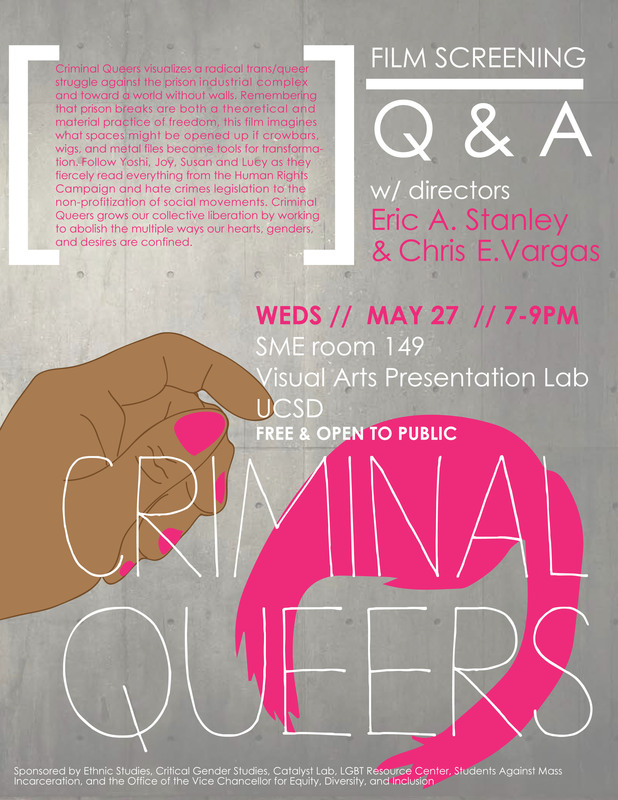 Chris Vargas and I will be screening Criminal Queers at the University of Chicago on Thursday, February 25, 2016, 7:00 PM at the Logan Center, Screening Room 201. The event is free and open to the public and will be followed by a conversation with Chris, Eric and Professor Lauren Berlant. On April 9, 2016 I will be giving the keynote address for Queer Death, De(con)struction, and Contagion: Affective Rhythms in Interdisciplinary Studies the inaugural Queer Studies Symposium at the University of California, Merced. I will be joining Craig Willse for the plenary session of the DC Queer Studies symposium Queer Beyond Repair at the University of Maryland, College Park April 22, 2016. 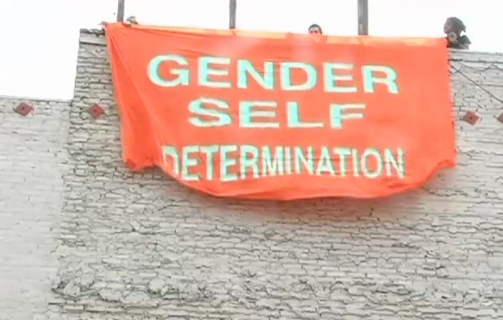 Check out this new interview, “The Filmmakers Behind ‘Criminal Queers’ Explain Why “Queer Liberation is Prison Abolition,” Toshio Meronek did for In These Times about Criminal Queers, making films with no budget and trans representation.